Our SuperDo insert is a prewashed insert for heavy wetters and overnight. 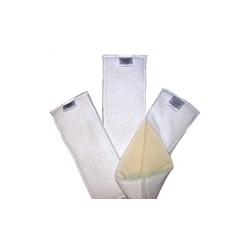 The SuperDo packs a powerful absorbancy with 6 layers of hemp terry and 2 layers of ultra-thirsty microfiber. This insert is even more absorbant than 2 microfiber inserts together. This comparison shows the SuperDo next to two microfiber inserts. The SuperDo is not only far more absorbant, but it's a lot trimmer, too!